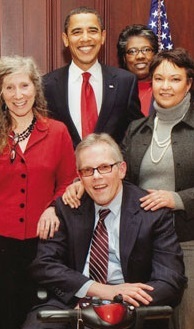 Mike McCabe with former EPA Administrator Lisa Jackson, far right, and President Barack Obama at her swearing in. Mike McCabe, former site administrator for the Chromium Cleanup Partnership, served from 2009-2015 and came to that position with more than 35 years of experience in energy and environmental policy leadership, including a term as a deputy member of President Clinton’s Cabinet. Drawing on that experience, McCabe served on the Obama/Biden transition team, leading the group charged with identifying top environmental and energy appointments. McCabe is the Principal in McCabe & Associates, a private consulting firm addressing energy and environmental policies, projects and opportunities at the community, state and federal levels. Before establishing his firm, McCabe served as Deputy Administrator for the U.S. Environmental Protection Agency from 1999-2001. Together with the Administrator and key administration officials, he set and communicated national environmental policy and enforced federal environmental laws. As deputy, McCabe functioned as the agency’s chief operating officer, managing EPA’s day-to-day policy and administrative operations and directing effective management of the agency and its 18,000 employees. He is the only individual in the Agency’s history to hold both positions of regional and deputy administrator. In his capacity at the agency’s COO, McCabe served on the President’s Management Council, a sub-cabinet group of top agency and department officials charged with managing the federal government. In addition, in April 2000, McCabe led the U.S. delegation to the G8 Environmental Ministers Meeting in Otsu, Japan. McCabe also was a founding member of the board of FirstGov – the government’s Internet portal to all official documents and Web sites. Before his term as deputy, McCabe was appointed in 1995 by President Clinton to be Regional Administrator of the EPA’s Mid-Atlantic Region. He led the implementation of federal environmental programs in Delaware, Maryland, Pennsylvania, Virginia, West Virginia and the District of Columbia. Before joining EPA, McCabe served as then-Sen. Joe Biden’s director of communications and projects, representing Biden throughout the state and applying national programs to meet specific needs in Delaware. From 1981 to 1985, he directed the staff of the U.S. House of Representatives Energy Conservation and Power Subcommittee. During that time, he was also a staff member for the congressional delegation to the first United Nations Conference on Energy in Nairobi, Kenya. McCabe organized and directed the national commemoration of the 10th anniversary of Earth Day in 1980 with events conducted in more than 1000 communities worldwide. He started his career in 1974 as research director for Gary Hart’s senate campaign. From 1975 to 1976, he served as legislative assistant to the senator, specializing in environmental and energy issues.